We have another exclusive interview for you on My Own Sense of Fashion. 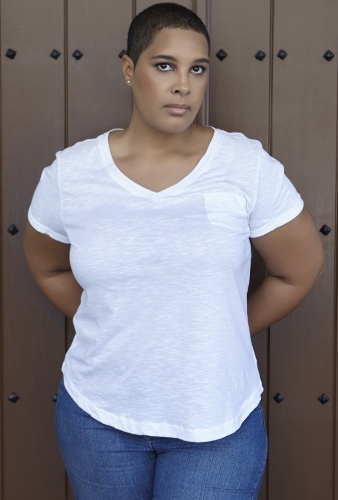 For this interview, I am talking to Plus Size Model LaTonia Robinson. Robinson has modeled in several major fashion events including Full Figured Fashion Week and appeared on major television networks such as Telemundo. Keeping reading to see what she had to say about her model journey to her thoughts on the changes being made in the fashion industry. 1. Now I know you initially started your modeling career in 2010 and resurfaced in 2013 what sparked your overall interest in modeling? I’ve always loved fashion and modeling has been something that I’ve always wanted to do. I grew up idolizing my mother’s Ms. Caribbean American crown, photos, and newspaper clippings. I daydreamed of the moment that I could fill her shoes and to be able to model to the masses. However, I’ve been a big girl since the day I was born and modeling really wasn’t an option for me because I was considered to be fat, stocky, or obese for that matter. So, while modeling had always been something that I wanted to do… I had to let that dream go… or so I thought. In 2010, I was invited to walk in Tampa Bay Fashion Week by Designer Nina Verklas. Needless to say, I was both excited and oblivious as to what I was getting myself into. It was as if I stepped into a movie as I pulled up to the parking lot. I was taken aback by the sight of a huge white tent located at the foot of the Hillsborough River, media personnel staking their claim in the pit, rows upon rows of seats, and the frenzy of models, makeup artists, designers and event staff all scurrying around to get ready for show time. I walked my very first professional show as the only plus-size model in her showcase and was greeted by applause and flashing lights. It was at that moment that I realized that I could do this! Those plus size women everywhere were in need of greater representation. 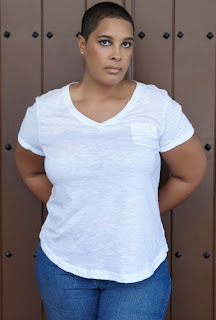 I went home and devised a plan as to how I was going to reemerge as a true Plus Size Model. During my transformational hiatus, a lot of things had changed within the industry. Thanks to the Internet and Social Media our voice was being heard through Plus Size Bloggers, Fashion Enthusiasts, Designers, Online Magazines Fashion Shows and Fashion Weeks. The curve movement was beginning to take up speed and it was time for me to my reemerge and make my mark. 2. Have you ever experienced any setbacks in your career? If so, how did you deal with them? I would have to say that the biggest disadvantage of being a Plus Model is the lack of opportunity. There are only a few fully functional independent designers and/or boutiques with I would have to say that the biggest disadvantage of being a Plus Model is the lack of opportunity. There are only a few fully functional independent designers and/or boutiques with continuous marketing campaigns, a few reputable event producers booking models, and even fewer agencies signing new talent for their corporate clients. While the tide is turning and the concept of using curvier models in advertisements and on runways is changing for the better, there is still much work to be done. I think the best way to overcome these setbacks is to face them head on. I’ve decided not to just sit back and wait for things to fall into my lap. I keep myself in the now by staying current on industry related news, trends, networking with industry peers, practicing my walk, conducting test shoots, promoting my projects, and constantly seeking new opportunities that are a good fit for my personal brand. 3. You’ve modeled on television and on the runway for fashion events such as Full Figured Fashion Week? Can you tell the readers more about this experience? Do you have a favorite memory? Both experiences have been a lot of fun. With television, you are working in a very controlled environment. You show up, you’re given a crash course from the producer of what to do for your segment, and then all eyes are on you when you hear the words “action”. Modeling in a major production like Full Figured Fashion Week is like no other experience on Earth. The Casting Tour goes around the United States and even to Canada. To be selected as one of their models out of hundreds of girls who audition is a complete honor. To me, this is the show of all shows when it comes to plus size fashion and plus size modeling. This event takes place in New York City and delivers on everything that you think a fashion week should be. It’s filled with plenty of networking, workshops, mini-events, fashion, and body positive attitude that is sure to boost anyone’s self-esteem. The designers and retailers understand our curves and the models share a true sense of comradery. The runway shows are filled with lots of excitement, and the audience is not afraid to cheer for those designs that really stand out. As an FFFWeek Model, I had the chance to work alongside my peers, share in experiences, swap tips, and made a few new life-long friends. 4. What is your favorite fashion must-have item and why? You know the one item you can’t seem to have too many of. business cards, and makeup essentials. 5. During recent major fashion weeks and events, Models Maria Borges and Lineisy Montero wore their natural hair on the runway. As a model with a trademark natural hairstyle, what are your thoughts on this? I really don’t see what the big deal is. The fashion industry is so afraid to embrace a look that may be different from what they’re used to. As a model, you will always endure a lot of criticism. It comes along with the territory. As a natural hair model, I may not get booked for a job just because I have natural hair. This is a challenge that I constantly have to face, but that’s a burden that I’m willing to bare. I love my “trademark natural hairstyle”, and the truth of the matter is that there are a lot of women out there just like me, who are seriously underrepresented. In the fashion industry acceptance is the name of the game, and the goal is to be able to sell-sell-sell. However, many designers and marketers are overly obsessed with how the customer will respond and are afraid to take risks. While I understand that a designer/client has a certain customer in mind when they create their products… the truth of the matter is that they have no control over who will actual buy it. They should keep in mind that beauty comes in different skin tones, sizes, and hair textures. Women want to see images of other women in advertisements and on the runway that they can relate to. I may not have the industries traditional look, but my look is still beautiful just the same. 6. Lastly, where can we see you next and how can we connect with you online? I have several new projects lined up, but I am not liberty to release that information at this time. Follow me online for all of my latest news, photos, videos, and personal moments. Special thanks again to LaTonia Robinson for taking time out of her busy schedule. Be sure to find her online to find out where you can see her next.